Graphic designers are responsible for coming up with the overall design and layout to visually display information. These professionals use from paper to computer for the design process. They typically use a photo or graphics software such as Adobe Illustrator to produce the final product. A good graphic designer job description will cover the basics of the job, the skills required, the education needed, any formal certification paths, and the job outlook for these professionals. Therefore, we will cover these sections in detail below. What Does a Graphic Designer Professional Do? 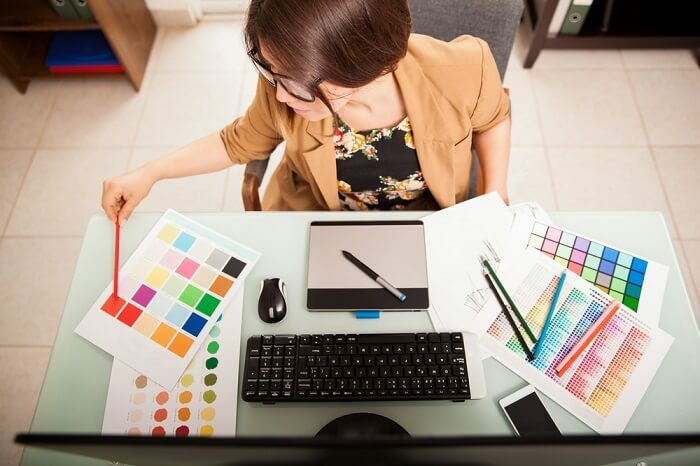 A graphic designer job description entails managing the production of visual information from idea creation to refinement to finished product. These professionals need to have a sharp eye for what is visually appealing and convey the main message through graphics. Those working in businesses or universities will have normal working hours but designers who are freelance will work hours that suit their lives. Moreover, the education expected when hiring a graphic designer is that they should have their bachelor’s degree and a working portfolio. There are certain job duties that make a graphic designer stand out and appear as an attractive candidate to a potential employer. Our graphic designer job description highlights the important aspects of the job. Identify client needs for a project and timeline required to complete that project. Use Adobe Illustrator or another program to create, edit, and produce the design. Make a unique and memorable logo that reminds customers of the business they are using. Use layering tools to create a complex project that has text and images. Enthusiastically revise designs that clients request changes for. Develop a cost-effective approach to creating and producing quality graphic images. Embrace variety in job orders and decide on the best dimensions of the finished product depending on the medium desired. Creativity skills. Graphic designers need to take ideas and turn them into aesthetically pleasing programs. They need to be able to create original and unique images to make the message memorable. They need to be able to quickly imagine a layout that will be appealing. Computer skills. These professionals need to have computer skills to design their graphics, to manage a portfolio, and to communicate with clients. These skills require mastering illustrator software, learning how to effectively use a blog or design a website, and communicate through channels such as email, social media, or group management tools. Networking skills. Graphic design is a job that often demands the designer to effectively network, build relationships, and identify additional work opportunities. Networking with existing clients can lead to identifying new clients and new areas of work. Time management skills. Graphic designers will frequently have more than one project they are working on and possibly more than one client. These projects will have different deadlines and time requirements. They must be able to effectively balance their time between various projects and produce work on a deadline. Reading a graphic designer job description should give some idea of the education required. In this case, a background in art and design, a portfolio, as well as a program certification is a desirable background. Graphic design is a field where everyone can have a portfolio that displays what they can actually do. It is the combination of education and portfolio that can set one graphic designer apart from their peers. Graphic designers should have a bachelor’s degree in graphic design. People who have their bachelor’s degree in another field can take some technical training to become a graphic designer. There are 320 accredited universities and institutes who offer graphic design. Having a level of artistic ability is required to be a graphic designer and some programs will require sketch samples prior to admittance. There is no license or exam necessary to be a graphic designer. Instead, employers will rely heavily on the portfolio of work when deciding which graphic designer to employ. These professionals can acquire specific certifications offered by various companies or graphic design organizations. While these certifications are not required, they can be helpful in a competitive market. Graphic designers are responsible for keeping current on the latest developments in the field and new technologies that will impact their work. There are art associations that offer courses on new programs/software/technologies. It is possible to become a graphic designer without experience. However, it is common for universities or institutions to encourage students to get internships. These internships help students understand the design process from start to finish. In addition, even designers without prior experience will typically have samples of their work to show through a portfolio. Their courses will help them to develop projects that can be placed in the portfolio. Students can also join organizations to network and meet professionals who are working in the field. Two unique ways to gain experience outside of school are to complete work for charities and to submit your work to competitions. Working for charities is an actual client who can vouch for the designers’ work. This also shows their willingness to serve the community. Submitting work to competitions is an easy way to get accolades that will vouch for the quality of one’s work. There are two broad categories of graphic design. There are designers who work for a company, university, or governmental agency, and designers who work for themselves. Those professionals who work for a company will have normal office hours for the most part. Under deadlines, there are graphic designers who might need to work longer hours, and even evenings and weekends. Designers who work for themselves are able to set their own hours. However, their hours are somewhat impacted by when their clients would want to meet. These professionals need to have excellent time management skills and be prepared to have periods when they are very busy and periods when they do not have as much work. Being a graphic designer is a very flexible job. People can choose the type of work that suits their lifestyle. They can also pick up freelance work while working for a business or strictly freelance. Graphic designers can advance to senior graphic design positions or to chief of design level jobs. Graphic design is a very competitive market. The median pay for graphic designers is relatively low for the level of skill they need in order to do their job well. The median salary is $48,700 per year with the potential for bonuses and commission. Salary growth is a definite possibility with more experience. Graphic design is a competitive market, but there are opportunities. These are particularly prevalent in the web environment and for high-technical skills. You can also look at web designer job description. Companies outsource some of the lower-level graphic design work. The growth of graphic designers is 5%, which is the average of all occupations. For people who are artistic, graphic design represents a field with many jobs that pay well. Finally, being a graphic designer is a rewarding and interesting job for people who are inclined toward art and technology. Our graphic designer job description shows that these professionals work in a flexible environment in which they complete many different projects and have authority over the final visual display of information. Maintaining a portfolio is essential for this career field and can provide someone with many potential opportunities for work.